Reeder Mesa Vineyards is situated in the foothills of the world’s largest flat-top mountain, the Grand Mesa, at an elevation of 5600 feet. The first grapes were planted in 1994, and after receiving winemaking awards at the amateur level, the winery was established in 2000. Doug and Kris Vogel are the owners, and Doug is the vintner/viticulturist. The Riesling that is grown and bottled here is a favorite, and boasts a light, crisp, fruity taste. 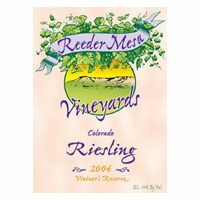 Reeder Mesa Vineyards participates in Colorado Mountain Winefest and will have tastings available at this event. The winery/tasting room offers spectacular views of the Grand Mesa. Land’s End Road is nearby and is a Scenic Byway. For a country setting with a special charm, Reeder Mesa Vineyards offers facilities for small groups to come and enjoy Colorado wines.In the foothills of the Grand Mesa, our Riesling grapes grow at 5600 ft. and our estate bottled Riesling is a favorite and our best selling wine. All of our wines are hand crafted from Colorado grapes. Take Hwy. 50 South to town of Whitewater and go just past fruit stand. Turn left on Reeder Mesa Road (at the wine bottle sign) and go 8 miles. Turn right at the sign onto a gravel road for 1/2 mile and the winery/tasting room is located in the first building.